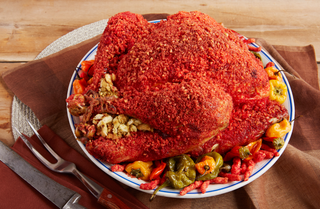 Among the rainbow of possible turkey brines, marinades, and rubs, none glows more luminescently and fluorescently than that of the Flamin’ Hot Cheeto crust. Dreamt up by the folks at Reynolds, these festive orange fowls are sure to satisfy your Thanksgiving audience consisting entirely of 12-year-olds. If prepubescent teens are indeed the intended demographic, it may also explain the vernacular used in this campaign: Flavor Blasted Turkey. Not flavor-steeped, nor flavor-suffused, but blasted, a verb reserved for wartime weaponry. Cheetos not your vibe? The geniuses at Reynolds demonstrate that you can also plaster your bird in “ranch-flavored corn chips” (Doritos Cool Ranch or GTFO) and “onion-flavored rings.” Just use your food processor to crumble those babies up, slather your turkey with butter and roll it around in the Frito-Lay goodness. Roast in your oven until the turkey reaches an internal temp of 180 degrees Fahrenheit and there you have it: flavor-blasted Hot Turkey in an Oven Bag. Cowabunga, as the kids say.